Imagine a hidden oasis in the heart of a concrete jungle just for children, where fairytales come to life. No, this is not Disneyland or some state-of-the-art facility. It is Children’s Fairyland, an Oakland landmark perched on the edge of Lake Merritt that is still as exciting and relevant today as it was when it was established in 1950. 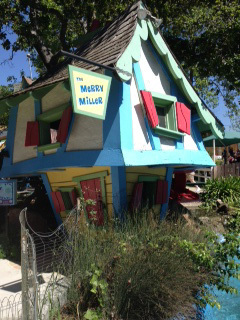 More than 60 years later, Fairyland has remained charming, able to coax out the imagination of a child with ease through its storybook sets, low-tech rides, animals, and gardens. A child can weave through an Alice in Wonderland-themed maze, explore the home of the little old lady who lives in a shoe, befriend a donkey, or hop on a train to feel the wind in their hair. The world is their playground in this magical land. While in Fairyland adults are only able to attend when accompanied by a child, Philanthropic Ventures Foundation was recently invited to visit for a Head Start Event, in which more than 1,000 children in the Head Start program attended Fairyland for a day of fun and exploration. Head Start is a child development program for three to five year old children from low-income families in Oakland that strives to develop social skills and school readiness. PVF funded a portion of this event through our Geballe Excursion Grant Program, which went to bus transportation for the children and their families. We were given the grand tour of the 10 acre theme park by C.J. Hirschfield, Executive Director of Fairyland. As we strolled about, it was a delight to see children enchanted by the simple structures, completely immersed in their own imaginations. C.J. showed us her favorite attraction, a small mound of grass that is one of the most popular activities; children spend ages running to the top and sliding down in an endless loop. Literary allusions are woven throughout the park. Classic fairytale stories come to life through towering statues and interactive structures. 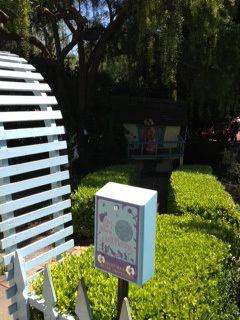 As an adult, you may miss the boxes scattered throughout the park, which are set at a child’s level for easy access. These boxes, which are operated by a special key, each play a recording of a different story. One of Fairyland’s most recent accomplishments has been translating each story into Spanish. Children that are more comfortable with Spanish are now included in this literary experience. These elements are designed to spark a love of reading, showing children how a book can be exciting and magical. Fairyland operates on the belief that early exposure to reading will promote school readiness and a strong educational foundation. C.J. and her team strive for this by fostering a whimsical and engaging atmosphere. PVF’s Excursion grants are meant to allow children from low-income schools the opportunity to partake in new experiences with their peers outside of the classroom. Fairyland is naturally an ideal excursion, as it effortlessly fuses fun and learning into an experience that even an adult can relish. For more information about our Geballe Excursion Grant Program, please visit our website! This entry was posted in Uncategorized and tagged Oakland, program grants, youth. Bookmark the permalink.